Deep ruby red with violet-purple reflections. Huge, fruity bouquet, black cherry and herb scented. Lush currant fruit with velvety soft tannins and perfect fruit acid balance. A wine of great harmony and intensity. The finish is long and spicy. Area of production: Torri di Torano Nuovo Harvest: October– by hand. Vinification: 15 to 18 days maceration on the skins with a daily pumping over of the juice. Fermentation takes place in stainless steel at 28-30 °C. Alcohol: 13% by vol. Grilled or roasted white and red meats, dishes flavored with mushrooms, garlic and rosemary. Excellent with polenta dishes and game. 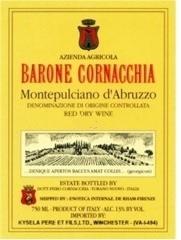 Barone Cornacchia was first established in Montepucliano in the end of the 19th Century and is considered a pioneer in the aging and bottling of Montepulciano d'Abruzzo. Located in the province of Teramo, the estate dominates the fertile valley of the Vibrata, lying at 240 meters above sea level. Cornacchia currently has 32 hectares (79.04 acres) of vineyard and the vines are 20 to 40 years old. The soil is calcareous and stony which is excellent for drainage. Moderate influences from the sea, only 15 km away, allow for perfect ripening. Color: Ruby red with garnet reflections. Bouquet: Ethereal, vinous bouquet with hints of violets intertwined with vanilla and spice. Taste: Elegant and round The flavor is full of ripe cherry and warm wood with leather and spice. The finish is persistent with hints of irises and violets. Vineyards: The castle is surrounded by 32 hectares of vineyards, 7 of which are in Chianti Classico. The vineyards are protected by a thick woods of live oaks and the high altitude provides an enviable and well-ventilated exposition. The stony-calcareous soil is rich in fossils and minerals which give the wines an admirable structure. The warm days and cools nights enhance an already seductive bouquet. The vineyards lie at 350 meters. Vines are an average of 25 years old. Vinification: Fermentation in stainless steel at controlled temperatures with maceration on the skins for 15 to 20 days during which time the juice is pumped daily over the skins. Aging: 12 months in French oak Allier barriques. Roasted or grilled red and white meats. Pastas with wild boar or hare sugo, lasagne, polenta and wild game. The color is a deep inky purple. The nose is a complex mixture of lifted berry fruit, pencil shavings/chocolate oak and ripe plums, with a floral lift from the Petit Verdot component. The palate is medium to full bodied. Due to the complexity of the blend, the palate starts with sweet plums and spice and then turns to blackcurrants and liquorice with dark chocolate interwoven throughout the mouth. Soft and sweet tannins then follow on with some great sweet fruit. Pairs well with sun-dried tomatoes and basil pesto ravioli.